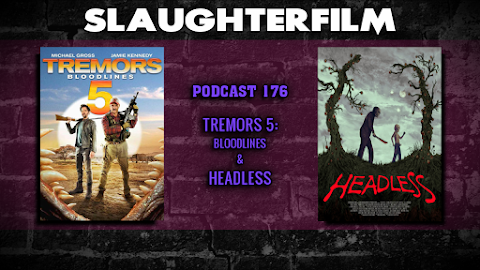 This week Forest revisits the Tremors films with the newest Graboid installment, Tremors 5: Bloodlines. Cory reviews Headless, the spin-off film of the critically acclaimed indie flick, Found. The Horror Duo recount their Halloween festivities, including costume parties, Evil Dead: The Musical, The Rocky Horror Picture Show & Psycho accompanied by the Erie Chamber Orchestra. All this and what is the deal with Christmas?! For more Slaughter Film news and reviews, as well as show notes and special events, make sure to visit our website; SlaughterFilm.com.